In the visually stunning floral-laden villas and castle-dotted fields of Renaissance Florence, only one flower was exquisite enough to steal the scene. With an uplifting scent reminiscent of fresh-cut blooms, freesia, also known as white iris, became the city’s celebrated symbol. Capturing a magical journey across bridges of gold to this magnificent bygone era, get ready to be entice with Crabtree & Evelyn’s Florentine Freesia Flower Water. As part of their Heritage Collection, Crabtree & Evelyn have released three floral waters (retailing at SGD$88 each) to celebrate the history of the use of flowers in perfumery. Each bottle is formulated without propylene glycol and comes with an elegant spray atomiser bulb as seen above. If you’re a big fan of feminine florals, the flower water collection would be perfect for you. 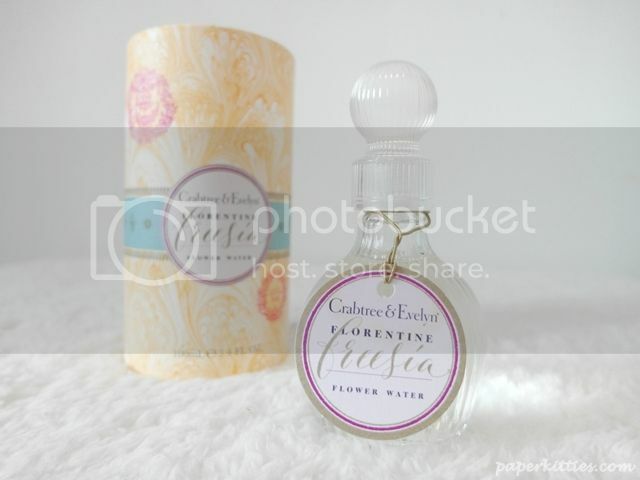 I was very fortunate to have received the Florentine Freesia Flower Water as it was love at first spritz. Pure and innocent, with a lovely spring floral scent of distinct Freesia. It provides a timeless and feminine scent with an interesting twist. It opens up with an intensely fresh, sweet and green scent of Italian freesia, Italian orange and pear. Followed by heart notes of cyclamen, muguet, fresh greens before settling down with amber, jasmine, musk as base notes. All this ended up with a long-lasting Freesia as a skinscent – clean, white and glowing, almost evoking the spirit of freshly pressed linen. It is simply, very lovely.